Welcome to Light Systems, Inc. We are located just north of Beaumont in Lumberton, Texas. Our business is delivering sophisticated lighting systems and elegant ceiling fans in the Southern Tradition. We carry a select line of Monte Carlo and Ellington ceiling fans popular with our Texas customer base. We offer light fixtures, wall sconces, and chandeliers to home remodeling contractors and individuals redecorating their homes. Located in the Golden Triangle of Texas, our store front serves the Southeast Texas, Beaumont, Lumberton, Port Arthur, and Orange communities. Learn how we handle shipping, refunds, exchanges. Over the spring and summer of 2004, Robin Perez has been expanding her business. She extended her building, located in Lumberton Texas, to the north to make way for a beautiful new showroom. This new display area is divided into sections by partial walls. You can feel the difference in mood as you walk from area to area. 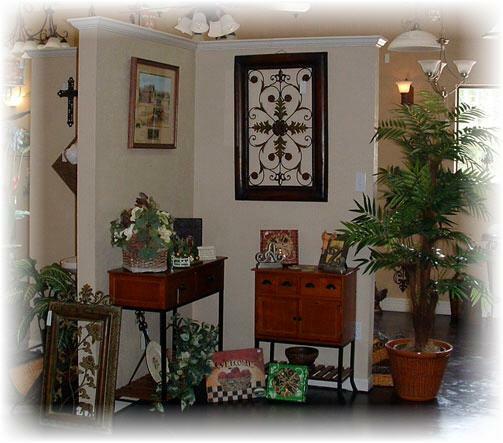 Her decorating experience and enthusiasm are demonstrated in this idea building environment. Come see the new showroom at Light Systems in Lumberton. It's a short drive from anywhere in Southeast Texas, just north of Beaumont on Hightway 69.